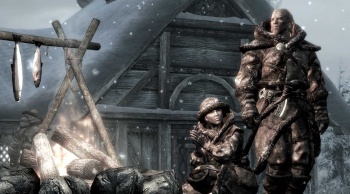 Bethesda has confirmed that PlayStation 3 owners will get their Skyrim DLC fix this month. After saying in January that Skyrim DLC "should" hit the PlayStation 3 in February, Bethesda has now made it official: All three content packs will finally be released for the platform later this month. Dragonborn, Dawnguard, Hearthfire and the 1.8 title update have all been certified by Sony Computer Entertainment America and the process is being wrapped up in Europe as we speak. Therefore, we now have release dates! As expected, the PS3 release order will reverse the original Xbox 360 launch schedule. Thus Dragonborn is first up, arriving on February 12, followed by Hearthfire on February 19 and then Dawnguard on February 26. The launch dates are valid for North America; European launch dates will be revealed as soon as they're finalized. And as a "sorry for making you guys wait so long for no particular reason" gesture, Bethesda is amking all three DLC packs available for half-price during their first week of release. So... we're good, right?